RAW HOLLYWOOD : LOVE JONES IS COMING BACK, MINUS THE BIG SCREEN AND ADD A STAGE! LOVE JONES IS COMING BACK, MINUS THE BIG SCREEN AND ADD A STAGE! Yes, you heard that right, Love Jones is coming back out.... in the form of a musical! Now as one of the biggest fans of this movie, I have to admin that I am kind of leery about a musical and how that is going to turn out. However, the cast is filled with some heavy hitters in the music industry so I'm sure that this is something that you do not want to miss. Next year will make it 20 years (has it really been that long) since Love Jones was introduced to us and many of us have been jonesing ever since. This is when many people fell in love with poetry, or at least I did for sure listening to Darius (Larenz Tate) being the blues in Nina's (Nia Long) left thigh, trying to become the funk in her right (that line got all the ladies going). Now I know some of you youngins' aren't really hip to this movie, however, this a perfect movie for "Netflix and Chill" so you definitely want to catch up, and just thank me later. The musical is set to start this Fall and will feature the likes of MC Lyte, Dave Hollister, and Chrisette Michele. With those power house voices, on top of Musiq Soulchild, Marsha Ambrosius, and Raheem Devaughn, this is bound to be an epic musical to witness. 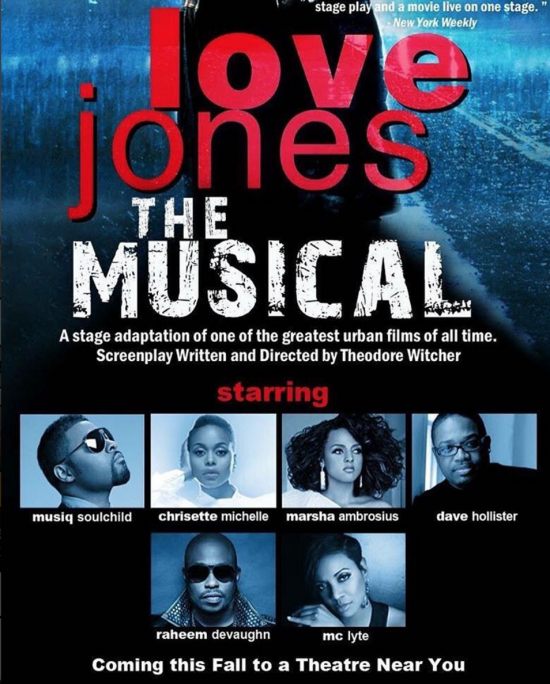 Are you interested in seeing Love Jones the Musical?! Will you be purchasing a ticket? !